Moo North: Cows Sense Earth's Magnetism A team of researchers sorting through satellite images of cows in 300 pastures makes a surprising discovery: Cows tend to face either magnetic north or south when grazing or resting. A new study suggests that cows sense the Earth's magnetic field and use it to line up their bodies so they face either north or south when grazing or resting. The discovery was made by a team led by Hynek Burda of the University of Duisburg-Essen in Germany. "I think the really amazing thing is that hunters and herdsmen and farmers didn't notice it," Burda says. Burda didn't set out to study cows. He normally studies small underground creatures called naked mole rats. They're blind, but have a kind of internal magnetic compass — they always build sleeping nests in the southern side of their little homes. Burda wondered if sleeping humans might do something similar. He decided to look at camping tents and fired up Google Earth on his computer, to get an overhead view of campgrounds. Tents were hard to see. But looking around on Google Earth, he realized he could see lots and lots of cows in nearby fields. So instead of trying to study people, he decided to see if cows were affected by Earth's magnetic field. "We just stopped looking on camping people and started to look on cows," he says. "It was almost an accident." Eventually, his team used Google Earth to look at more than 8,500 cows, over 300 pastures all around the world, according to a report in this week's issue of the Proceedings of the National Academy of Sciences. 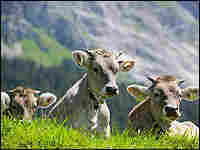 By analyzing the images, the team found that cows tend to face either magnetic north or south when grazing or resting. "Most of them actually align in a north-south direction," says Burda, and this held true regardless of where the sun was, or how the wind blew. To see if another large mammal might behave in a similar way, the researchers also looked at deer. They watched deer grazing and also looked at oval hollows in the snow that deer make when they're sleeping. Again, they found a north-south orientation. "It's a very clever use of Google Earth, and the evidence is quite compelling. It does seem that these animals are detecting the Earth's magnetic field and using it to point in a north-south direction," says Richard Holland, a biologist with the University of Leeds in the United Kingdom who has studied how bats navigate with the help of internal magnetic compasses. Other researchers are also impressed with the new study. "I was really amazed at the consistency with which they found north-facing cows and deer. It was really intriguing," says Peter August, a researcher at the University of Rhode Island in Kingston. In the past, August has done studies showing that some mice can sense the Earth's magnetic field, but these days he works on using imagery to study conservation biology and ecology; he found this novel use of Google Earth to be particularly interesting. "It was very imaginative. It demonstrates yet again all the unexpected uses of and value of digital geospatial data," August says. Holland says that other researchers should confirm the finding. One way of doing that would be to "start going out and putting magnets on the heads of cows and horses and deer, to see how that affects them," he says. "That's one of the more traditional ways of testing if they have a magnetic sense." If they really do have an internal compass, he says, the magnet would mess it up. Some migrating birds use internal magnetic compasses for navigation, and bats do, too, but Holland says it's not clear what cows or deer would get out of it. He says it may just be a leftover from their ancestors' ancient wanderings. Burda, for his part, says that magnetic compass orientation has been relatively under-studied in mammals. Why cows use this "is the biggest question," he says. "Maybe they just feel better in this position."